​Colorful, versatile, and good for you. Here’s a grain salad that stands alone as a hearty main course and travels well for picnics and lunches to go. Add poached salmon or grilled meat for an easy make-it-ahead dinner. If you prefer gluten-free, substitute brown rice for the farro. Toss the kale with the lemon juice and massage the leaves for about 1 minute. Set aside. Heat the oven to 400 degrees. On a large sheet pan, toss the cauliflower or broccoli with 2 tablespoons olive oil and sprinkle with salt and freshly ground black pepper. Roast for 20-30 minutes, depending on the size of the pieces. On a second sheet pan, toss the butternut squash with 2 tablespoons olive oil and sprinkle with salt and freshly ground black pepper. Roast for 15 to 20 minutes until lightly browned. Set aside the roasted vegetables. Meanwhile, in a large saucepan, combine the farro, 1 teaspoon salt, bay leaf, and a pinch of red pepper flakes with 4 cups of water. Bring to a boil, reduce the heat to medium-low and cook for 20 minutes or until the farro is tender. 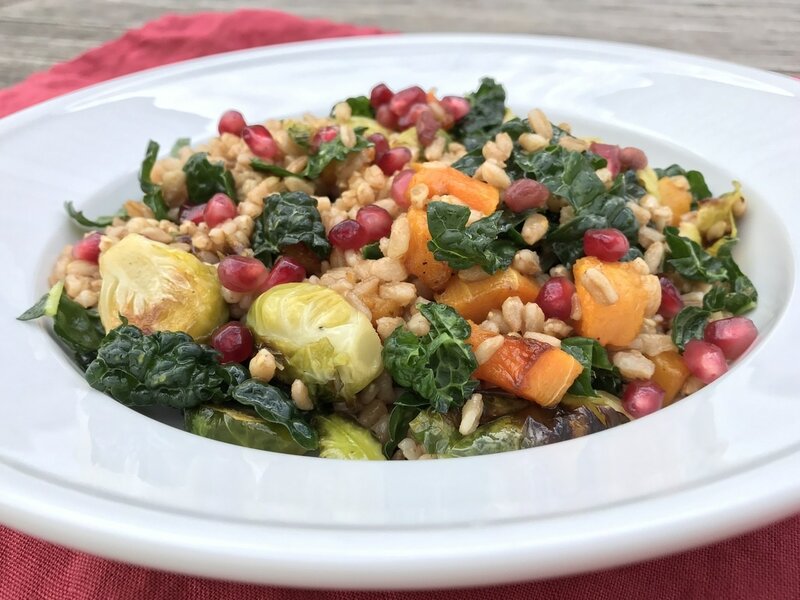 Drain, discard the bay leaf, and toss the farro with the dressing. To make the dressing, warm 2 tablespoons olive oil in a pan over medium low heat, add the minced garlic and sauté for 1 minute. Off the heat, add 2 more tablespoons olive oil and the balsamic vinegar. Whisk together and stir into the farro. In the same pan, heat 1 more tablespoon olive oil and sauté the brussels sprouts for 5 minutes or beginning to brown at the edges. 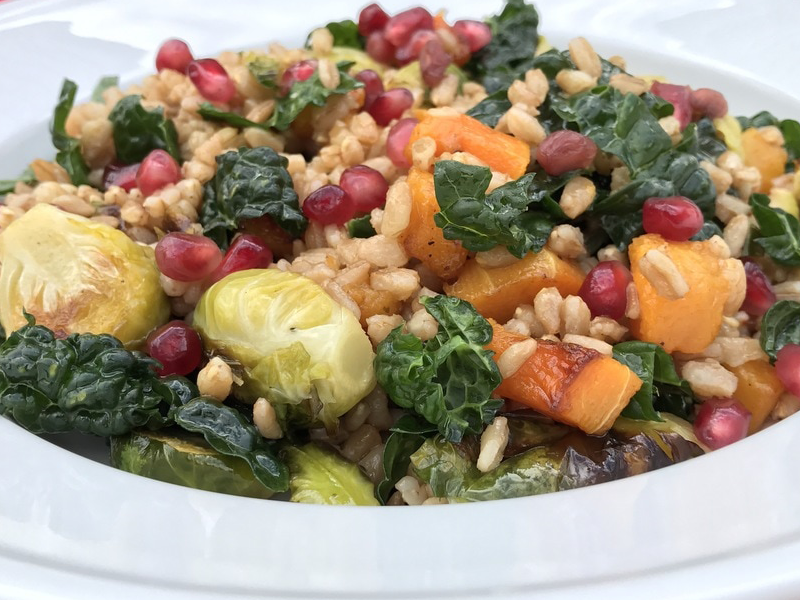 In a large bowl combine the farro, roasted vegetables, and brussels sprouts. Fold in the kale. Top with the pomegranate seeds and nuts, if using. Serve warm, at room temperature, or chilled.